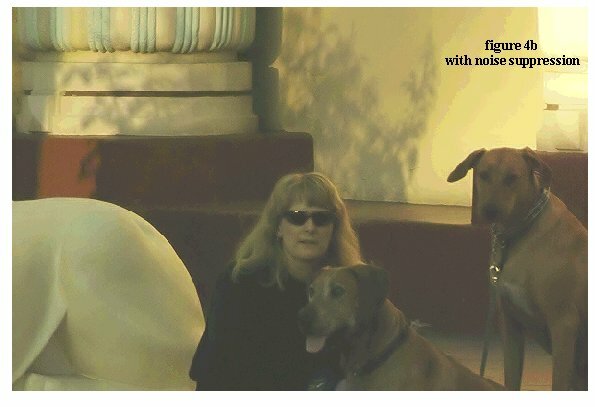 Noise in digital cameras can be defined as anything visible in the captured image that was not present in the scene. However, in this discussion we will exclude highly structured image problems such as radial patterns or artifacts and concentrate on the more random noise sources. Noise in digital cameras is very different from noise in film, as illustrated in figures 1a and 1b. 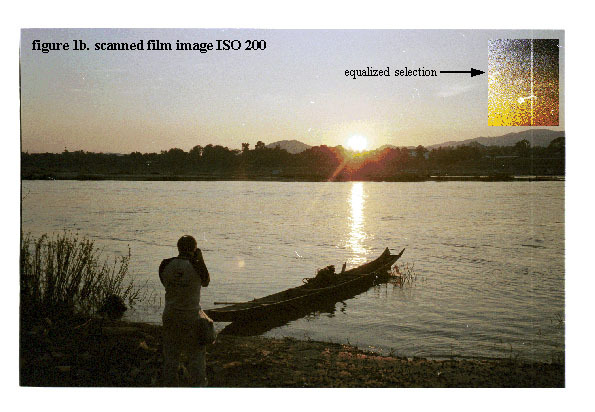 Figure 1a is an image of a sunset taken with a digital camera, and figure 1b is the same scene shot with a film camera. The film image in figure 1b has some dust on the negative that was captured by the scanner, and also a line defect due to an interrupt that occurred during the scan. But the most significant difference between the film image and the digital image is film grain, which creates a pattern of noise that is much more noticeable than the random pixel to pixel variation in the electronic image. Over the long history of film, photographers became accustomed to the look of film grain. Indeed, film grain was often enhanced to create an abstract look to add interest to an image. By contrast, the expectation with digital photography is that the noise levels will be lower than film, and so digital camera image noise has come to be an important metric of image quality. 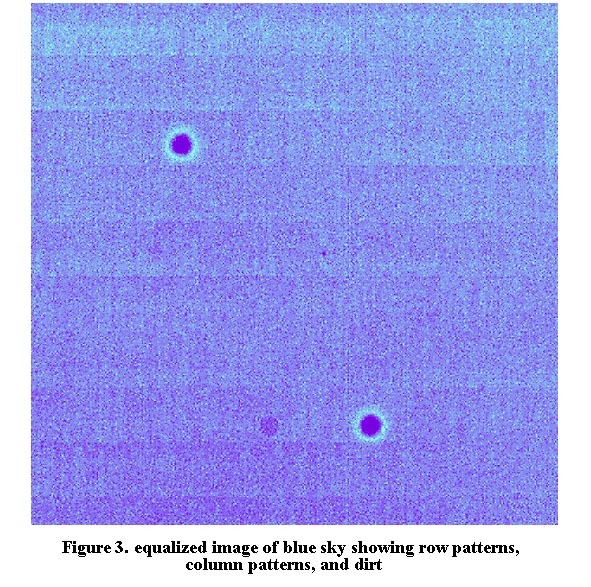 Let us begin the discussion of noise in electronic image capture systems with figure 2. At very low input signal levels (i.e. low light levels) the image capture system noise floor dominates all other forms of noise. The noise floor is determined by the type of read circuits in the image sensor, the transistor characteristics, or imager support circuits such as the analog to digital convertor. Good noise floor performance is fairly easy to achieve with CCD imagers, which is one reason CCD sensors have survived in spite of inefficiencies inherent in the way CCDs extract signals from the sensor array. However CMOS based imagers can have noise floor performance equivalent to CCDs, at a cost of additional pixel complexity. As the light level increases, the noise associated with the light itself starts to exceed the noise floor. This noise source, known as "photon shot noise", is proportional to the square root of the signal level. If the signal level is increased by a factor of 4 (two f-stops), then the noise increases by a factor of 2, and the signal to noise ratio increases by 2. 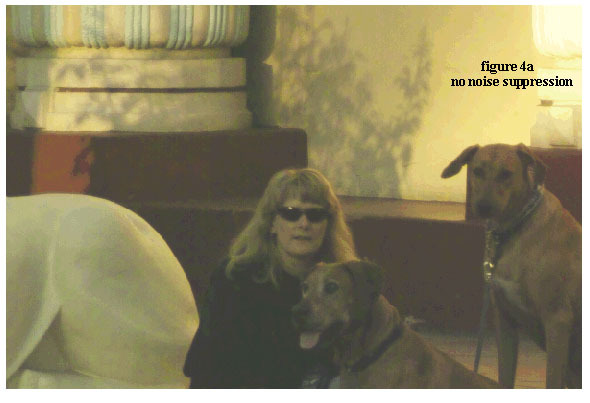 This type of noise is discussed further in "Essentials of Digital Photography # 2, Pixel Size". As the signal level reaches the maximum value that the sensor is capable of capturing, the noise drops because the signal is pinned at the saturation value. The ratio of the largest signal that a sensor can capture, to the noise floor, is often referred to as the dynamic range of the camera system. The dynamic range is sometimes expressed in bits. A camera with 10 digital bits of data per color can represent 1024 possible signal levels per color, for a total of 30 bits of data per pixel. This image capture system would have the darkest level represented by the count "1", and the brightest level by the count "1024". Semiconductor image sensors work by converting energy from photons into electrical energy, in the form of a current or voltage signal. Unfortunately thermal energy present in the semiconductor can also generate an electrical signal that is indistinguishable from the optical signal. This thermal signal is known as 'leakage current'. Most consumer cameras use silicon photo detectors, which typically have an increase in leakage current of about a factor of 2 every 8 degrees Centigrade. So if a camera is left in a hot car, and rises to a temperature 24 degrees C above room temperature, it will have leakage of 2 x 2 x 2 = 8 times higher than room temperature. The effects of leakage current are most apparent in long exposures in which the light signal is very small, comparable to the signal from the leakage current. 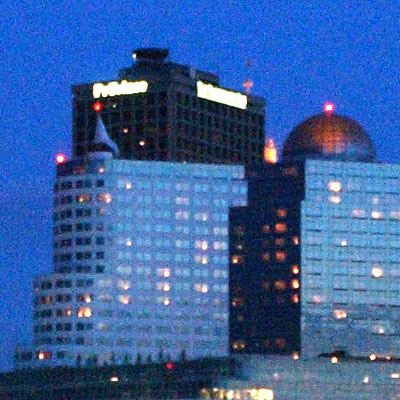 Leakage current is fairly repeatable from frame to frame, so one way to improve image quality for long exposures is to capture a `dark' frame with the shutter closed, the subtract this reference image from the real image frame with the same exposure time, to remove some of the error. Image sensors are composed of a array of pixels arranged in a regular pattern of rows and columns. There are many ways in which this regular structure can manifest itself in the output image, an example that has both a row and column patterns is shown in figure 3. In the example, it appears that the column patterns are due to random sensor defects, and the row patterns are more regular, probably as a result of read circuit behavior. These row and column patterns are particularly disturbing because they are not present in film images, so they call attention to the electronic capture origin of the image. To make matters worse, the human vision system is very good at detecting regular patterns in scenes, even at signal levels well below the random noise of the image. Figure 3 also shows one of the most annoying problems with digital cameras, defects in the optical path near the focal plane. This problem is particularly bad with SLR cameras, because every time the lens is removed, dust or water droplets can deposit on the protective cover glass over the sensor. Even without a removable lens, dust can be a problem because it can shake loose from inside the cavity around the sensor, or from the mechanical shutter. Most camera companies recommend that sensor cleaning be performed only by approved dealer representatives, which is expensive and time consuming. This is because the surface of the cover glass over the sensor often has delicate optical coatings, such as an infrared blocking filter. Some camera companies have started offering more innovative solutions to the dust problem, such as moving the protective cover farther from the focal plane to keep the dust out of focus. Or in recently announced product, an ultrasonic cleaner for the sensor protect glass surface. Most digital cameras have some form of noise abatement software that is either built into the default image processing, or at least available as an option. And there is also a plethora of third party noise reduction software that can be purchased, which may be specialized for certain image problem situations. The most straight forward software noise reduction strategy is to average across pixel values, which suppresses local variations due to random noise, but also acts to reduce image sharpness. 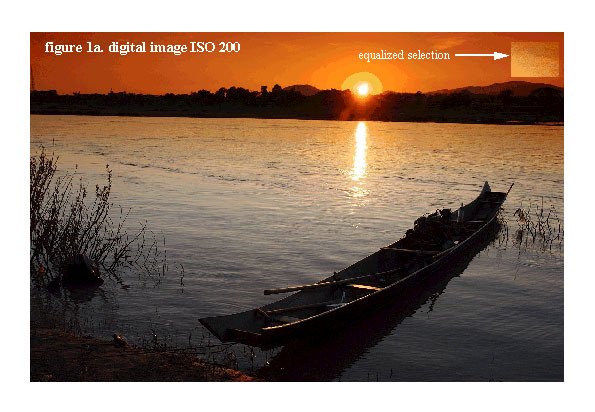 Many cameras have noticeably less sharpness in images shot at high ISO because of this trade-off between noise suppression and image sharpness. More sophisticated noise reduction software attempts to find correlations in the image data corresponding to real features from the scene, so that the real features can be distinguished from uncorrelated random noise. This type of image processing can increase the useful signal to noise ratio, however it requires more computation power and time. The future of computation promises further dramatic increases in processing power, at lower cost and energy, and some of this improvement will surely find its way into digital photography applications. Figures 4a and 4b show an example of the effects of a commercially available third party software, "Grain Surgery". Note that the blotchy color noise in the shape at lower left has been suppressed. At the same time, the increased contrast on the silhouette of the dog's ear at upper right shows that the improvement in noise was not accomplished simply by smoothing. The practical significance of noise in contemporary image sensors is how far the ISO rating can be pushed while still achieving acceptable image quality. It is interesting to consider how high ISO ratings might go in future cameras, based on both improvements in sensor technology and image processing. However, it is important to note that the fundamental limit of noise is the number of photons that can be captured per unit time and per unit sensor area. Sometimes it is a good strategy to even add some digital generated grain (using Photokit or Grain Surgery). The random nature of this grain results in a film like look and is more pleasing for many people. Even better is often to remove noise and then add grain.